I have not fallen off the face of the earth, contrary to what you must be thinking by now! I am working on some projects to share, but thought that today, I'd share some of our own little Winter Wonderland! This photo is looking out from the front of the house. Our front yard is about 5 acres. This looks out over one of the side fields. You are seeing the neighbors barn and horse arena. This field is probably 2 or 3 acres. This looks out the back of the house toward the other side. This is DH's equipment shed-workshop. Just one of his big yellow toys in the picture! This is a view of the woods behind our house. Again, our back yard is probably 2-3 acres. There is a pretty large field from the house to the woods line. I leave you with our two furry friends, waiting for Santa to come! They had some yummy bones in their stockings, and were pouting, as Uncle JB was not up yet. I'm working on a project for Wednesday's Calendar workshop, so I'll be glued to my room today! Wishing you all the blessings of this beautiful season. Today's Repeat Impressions' Stamp of the Week is "Winter's Eve". This is such a versatile and beautiful little stamps - one of my favorites! So sorry this blog post is lacking all of the details! We have our DS home, and are trying to get all of the last minute Christmas details worked out before the candlelight service at church this evening! Please check out the Repeat Impressions' Blog, The House That Stamps Built, to see the creations by my fellow Rockstars, and to get all the fun deets on getting this stamp for 50% off! If I don't get back tomorrow morning, I wish you all a wonderful Chrismas! Great Impressions Image #H236 Merry Kiss-Moose, Great Impressions sentiment #B229 Happy Hearts, Copic Markers, Spica Atyou Glitter Pens, Marianne Tree Die, Tim Holtz Broken China Distress Ink, Glue Pen, Glitter, Dimensional Foam, Perfect Layers Rulers (see sidebar for details). Isn't that moose the cutest? He's got his tree all sparkly, and ready for Christmas! I'm entering this in the December Challenge (anything goes) at Great Impressions. You still have time to enter! Check it out HERE. And be ready for more Great Impressions goodness! I'm thrilled to have been asked to be their Guest Designer for the month of January, and will be showcasing several stamps! Can't wait to get them all inked up! Now, here is our tree all ready for some pretty packages! I've chosen the photos that show the mantle, where we place our beautiful Nativity set. Thanks for stopping by! I'm off to a Christmas luncheon with two amazing friends!!! Welcome to a new Repeat Impressions Challenge! Today starts a new Designer Choice Challenge, and Geri is our fabulous hostess. She has challenged us to you two or more shades of blue on our projects. There are actually several shades of blue in the DP, Ink, and CS colors. I love this sentiment, and will use it for years to come. Time to check out my fellow Rockstars' creations - I'm sure they have some beautiful cards to share! After you are inspired by these wonderful ladies, grab your 'blues', and create! Link up to the challenge at Repeat Impressions blog, The House That Stamps Built, and you could be the big winner! Check out the blog for full details! Thanks for stopping by - hope you are all ready for Christmas! WELCOME TO THE DECEMBER “12 DAYS OF CHRISTMAS” BLOG HOP! Happy Holidays from everyone at the Blog Hop for Sean & Regina! Thank you for playing along in our December blog hop! The Blog Hop with Sean & Regina features only Gina K. Designs stamps for our monthly blog hops! This month, we are featuring the “12 Days of Christmas”. Each blog hop designer will be hosting a day from December 13 – December 24 that will feature Christmas/Holiday cards using a Gina K. Designs stamp set. A list of designers are listed below with the day they will be hosting. You are invited to take part in each of the twelve days. Subscribe and comment on the designer’s blog hop for the day and at the end, one person who has completed the entire twelve days will win a wonderful GINA K. DESIGNS PRIZE PACK! Enjoy yourself as you hop along for the holidays! Now it is time to blog hop with all of our friends! Visit each participating blog on the list below from December 13 – December 24. If you follow rules 1 – 3, you will be eligible to win the grand prize of a Gina K. Designs Prize Pack. At the end of the hop, a random winner will be chosen for the Blog Hop Grand Prize using comments and followers from each blog. We will be posting the winner a day or so after the holidays! 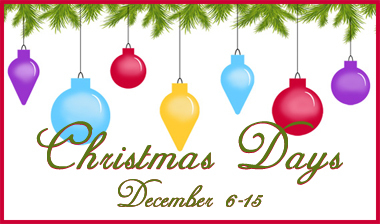 Tomorrow, Cheryl Wright will be posting the next in the “12 Days of Christmas” blog hop! Please visit her blog. It's sketch day at Repeat Impressions! Repeat Impressions 'Skating Penguins' #301, Copic Markers, White Fun Flock, DCWV DP, Colorbok CS, Ribbon from my scrap pile, Perfect Layers Rulers for perfect mats (see sidebar for details). No sentiment yet, as I'm not sure who this will go to, and for what reason. I'm thinking that I'll use something basic, like Hello, or Thinking of You, but just not yet sure. Next on your stop is the RI blog, The House That Stamps Built! Check out the wonderful creations by my fellow Rockstars, then nab the sketch, and link your project up! So... you all know what sort of rushing around there is during the month of December. To give you an idea of how far behind I am, I plan to BEGIN baking today and BEGIN shopping for gifts tomorrow. Feel free to laugh. Crazy, I know. Some years we don't shop until the 23rd, so this year is not so bad! I also enjoy making Christmas cards for friends, but since it was already December 9th, odds were that was not happening unless I found a CAS card that was easy to mass produce. This was the card I made a week or so ago for a very special birthday. After creating this, I decided it would work for the Christmas cards I needed, as well. Thank goodness for Eclipse tape and Distress Ink! Some of you will be receiving this card - hope you enjoy it as much as I enjoyed making it! Thanks for stopping by today - hope YOU are all ready for the holidays! For 10 days, that began on Thursday, December 6th, the AR Girls will be sharing ideas for presenting holiday gifts using templates from Creations by AR! Not only will you get to know each of the AR Girls, but every day for 10 days they will bring inspiration to you with their holiday projects. So, join us daily at the Creations by AR FaceBook Page or at our AR Group on Paper Craft Planet. Welcome to Day 5 of the hop! I am pleased today to be showcasing one of my favorite Creations by AR templates, the Gift and Card Combo. Here are all three of my creations. Rubber Stampede Image, Tim Holtz Distress Ink, Bazzill DP, Ribbon from my stash. I fully intended to fill this box with tags, but ran out of time! So it's filled with ugly M & M's. The sentiment is by Penny Black "3274H Once a Year", and reads "At Christmas play and have good cheer, for Christmas comes but once a year!" Each of these adorable gift boxes has an adorable slide out drawer, for candy, tags, gift cards, jewelry, ornaments, Copic Markers, etc! This sentiment is from Impression Obsession "Peaceful Season Wishes #D8623"
One winner each day will receive a template of their choice from Creations by AR. The Daily Prize winner will be chosen from comments left on the designer's blog who is featured that day. The daily winner will be announced the following day on the AR FaceBook Page and on our AR Group on Paper Craft Planet. The Grand Prize Winner will receive ONE TEMPLATE A MONTH FOR SIX MONTHS beginning January 2013! The Grand Prize Winner will be randomly chosen from comments left on the AR FaceBook Page and on our AR Group on PCP between December 6-15. Winner will be announced December 16. Day 4 was Julia be sure to pop over and see what she made I know it was amazing. Day 6 will be Lori, and she has a special treat ready to show you so remember to pop over tomorrow. Thank you so much for stopping by and I hope your holiday season is wonderful! The holidays are coming at us pretty quickly! 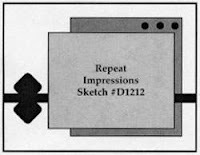 Today, I have a new Stamp of the Week to share, for Repeat Impressions Stamps. Repeat Impressions 'Santa Cat' #3307, Repeat Impressions 'Meowy Christmas' #2211, Frosted Lace Stickles, Copic Markers, Gold Stickles, DCWV DP, Ribbon and bells from Wal-Mart, Red CS is Bazzill. Check out what my wonderful fellow Rockstars have created with Santa Cat! Now, hop on over to the RI blog, The House That Stamps Built, to see how you can get this handsome dude for 50% off this week! Have a great week - Patti J. 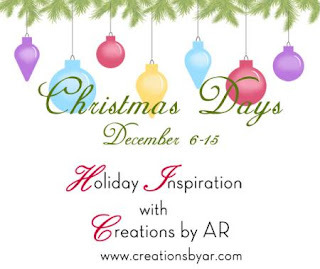 Hope you are following along in the Christmas Days with Creations by AR blog hop! Each day features a different designer, AND a different template! Check out the Creations by AR blog for full details! Hope you'll stop back by here on Monday for day 5! I have something to share that you will want for your own! even for the 'non-cutting machine', 'scissors weilding' me! I am the lucky hostess this week for the Repeat Impressions Designer Choice Challenge. is to create a bag and/or tag project. Tag and bag, complete with crooked ribbon (this was fixed, but not until after the photos were taken. Oops! I used the Repeat Impressions 'Peaceful Observation' #2001, and 'Meowy Christmas' #2211. Colored with Copics markers. Ribbon and Twine on tag are from Flourishe's, and the ribbon strip on the bag is from Hobby Lobby. Back view, showing magnets. I just cut up a magnetic business card for my magnets. I made my tag to adhere on the bag with magnets. After the gift is opened, the tag can hang on the fridge door, or file cabinet for a few days. Head over to the Repeat Impressions blog, The House That Stamps Built, to check out the inspiration of my fellow Rockstars! I know they have some fabulous projects to share! Then, grab your stamps and link up YOUR creation to Mr. Linky - we'd love to see what your take on this challenge looks like! Squeal.....how am I ever supposed to resist a cute snowman? And this little guy is cuteness galore! Stamping Bella 'Frostier' #KS207, Copic Markers, CS Scraps, Amuse Baker's Twine, Red Ribbon from Wal-Mart, Sentiment Stamp from $1 bin at Michael's several years ago. Meet 'Frostier' by Stamping Bella! A couple of months ago, I won my choice of Bella stamps, just by commenting on the blog post! Of course, as soon as I saw this image pop up, I quit looking. Anyway, the challenge this week at Stamping Bella, is to create a tag, using one of Stamping Bella's images, so I'm entering this in the challenge. Wish me luck! There are MORE cute images than I can count! If you read my previous post, you know that our family is happy dancing! I have a couple of tags to share with you today. Both are created with the Memory Box Winter Collage stamp. Memory Box Winter Collage G-1830, Glossy Tags, We R Memory Keepers DP "Snow Flurries-Winter Frost", Tim Holtz Distress Ink Tumbled Glass, Amuse Pigment Ink Navy, Copic Markers, Colorbok Navy CS, Ribbon from Really Reasonable Ribbon, Bell from Hobby Lobby, Tag is Stampin'Up Decorative Label Punch, folded in half, Perfect Layers Tools (see sidebar for details). One I stamped in navy ink, and slightly colored, and the other was heat embossed, with white embossing powder on a glossy tag, and Tumbled Glass Distress Ink sponged on. The glossy tag made it difficult to get a good photo, as it wanted to reflect light. I even resorted to an umbrella...lol. I'm actually going to enter a challenge today! Joan's Gardens' challenge for this week is to create a tag. I'm sending two - what a bargain!